Active carbon filters have been proven to remove and prevent odors and fumes from building up in recirculated air. Permatron offers two types of disposable, high density granular carbon pack commercial air filters. CWB carbon packs contain two types of sorptive media, equal amounts of impregnated activated alumina with potassium permanganate and activated carbon bonded within a media for a uniform bed for light gas removal including ammonia, formaldehyde, hydrogen sulfide and sulfur dioxide. Both Model CWCPO300 and Model CWBPO375 are available with different densities of carbon, depending on the odor removal application. These active carbon filters are sold in an unframed pad form, a framed pad option, or a framed prefilter, pad and afterfilter all together. The 3-stage filtration styles are available with a ¾″ polyester prefilter for particulates and polyurethane foam afterfilter to capture remaining particulates and prevent carbon from entering the system. Moisture resistant beverage board die cut frame with stabilizer face grids and wire reinforcement are also available. 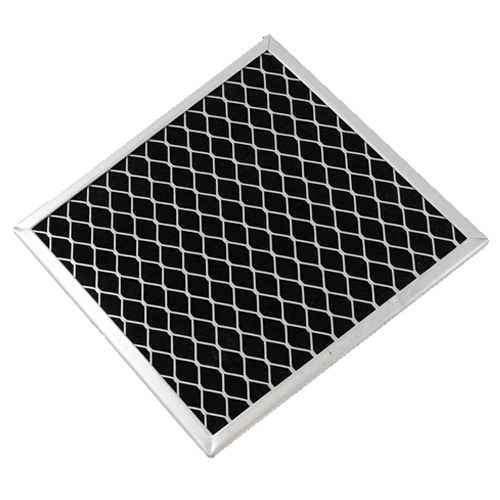 Activated carbon air filters remove and prevent odor, fume or gas from building up in recirculated air.